Thank you all so much for taking the time and trouble to visit us in Knysna on Tuesday. We all really appreciated your presence and your message of goodwill and support. 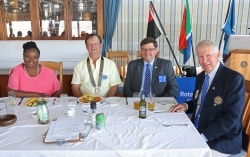 I thought it was a wonderful meeting and the Rotary spirit was clearly in abundance. After the meeting, many of our members mentioned how much they enjoyed the meeting. Having our Executive Mayor present added a special dimension, especially since she is a very busy person and could have been called away at short notice.